We hopped on a shuttle from Lanquin heading for Antigua the following morning. Despite everyones warnings about Guatemala City being a bit rough I had been feeling a bit bad that we were going to give it a miss and not make our own informed decision. Driving through it though on our way to Antigua I realised we had definitely made the right decision not to stop. The sprawling smoggy chaos had absolutely no appeal whatsoever! The trip was supposed to take us about 6 hours but thanks to lots of traffic and an extremely worn tire which needed changing we arrived to Antigua a couple of hours late. We had intended to stay at the Yellow House Hostel after reading about it on a few other peoples blogs but our shuttle pulled up outside Zoola. Eyeing the stormy looking clouds over head, and after checking it out quickly we decided to just crash there, along with most of the rest of the shuttle! The bunk beds were huge and we managed to save a little bit on our accommodation costs by sharing the bed. yay! Antigua is a beautiful colonial style town, with cobbled streets and a lovely town square.Its famous for its well-preserved Spanish Baroque influenced architecture as well as a number of spectacular church ruins. In addition to it being designated a UNESCO World Heritage Site its also become a pretty popular place for people to come and learn Spanish so the tourist infrastructure is pretty well established. Formerly the capital of Guatemala, several large earthquakes throughout history meant the destruction of a lot of buildings and the eventual removal of the capital to safer ground. After a bit of a downpour we headed out for a walk around town and to pick up a few drinks with the others from the shuttle. Back at the hostel we commandeered the tv room and settled in for a movie night. Although we were all pretty tired and most of us were asleep for the end. Waking up the next morning Ty was really pissed off to find that someone had stolen his hat. It was a xmas present from me last year so was in good condition when we started our journey but by now it was sweaty and covered in salt stains from swimming in the ocean so god knows why anyone would want to take it but I hope they have bad travel karma for it! 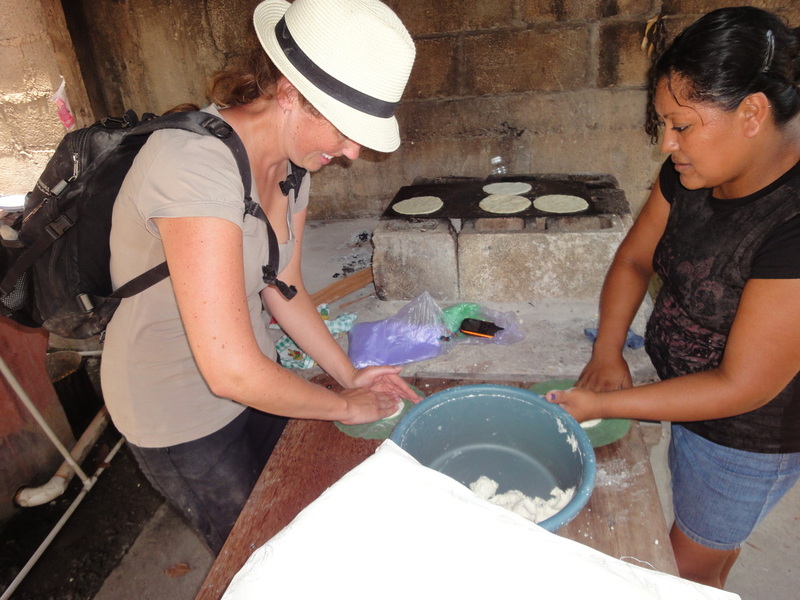 Wandering around town we sampled some 'pupusa''s - apparently traditional El Salvadorian street food (will get it up on best bites eventually!). Basically a maize mixture filled with cheese or meat and then bbq'd - so cheap and so delicious!! Three large volcanoes dominate the horizon around Antigua. There are a plethora of tour agencies offering walking tours to the craters but we decided that seeing as we have seen a lot in Guatemala already we would save our volcanoe trips for when we get to Nicaragua. Antigua is a central hub for transportation around western/southern Guatemala and we tapped into our Kim/Barry information to get a chicken bus from the city out to Lake Atitlan the following day. Recognized to be the deepest lake in Central America and surrounded by 3 volcanoes it is often described as one of the most beautiful lakes in the world. I have to say I'm not so sure that I agree. Possibly in summer when the volcanoes would be unveiled from the thick mist that was present when we were there it would be pretty picturesque, but the lake town of Panajachel didnt live up to my expectations and although initially planning 3 or 4 days there we left after just two. A very full mini van! We were dsiaponted when we left BC that Memo chose not to come out say goodbye to us, and Ty thought that his behaviour as someone who had grown up in a western country was the height of rudeness. Learning our lesson again that things always run on island time, we were at the bus station at 7.20 for our 7.30 departure, only to actually be on the bus and heading south at 8.45. 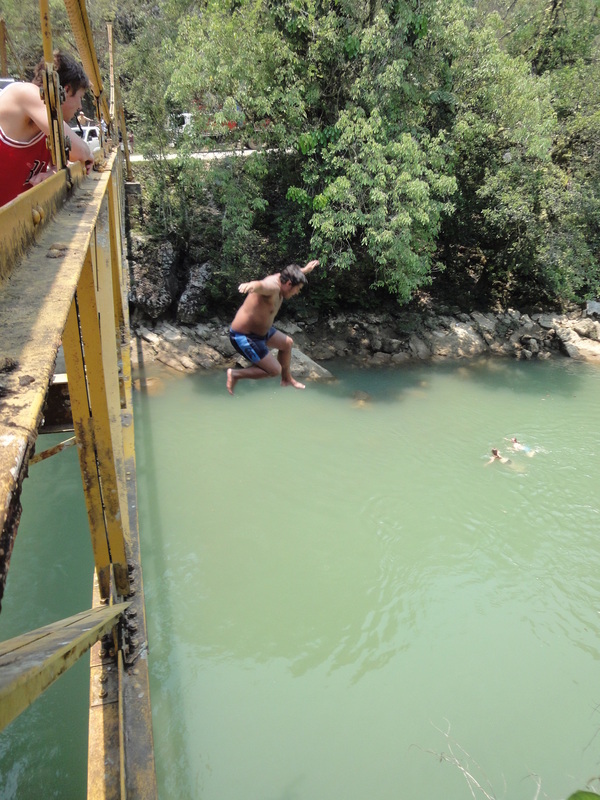 The next stop on our journey was Lanquin, a tiny mountain town, and the jumping off point for Semuc Champey, one of Guatemalas best natural features. We were lucky in that there were only 7 of us in the collective so we had a bit of space to spread out. 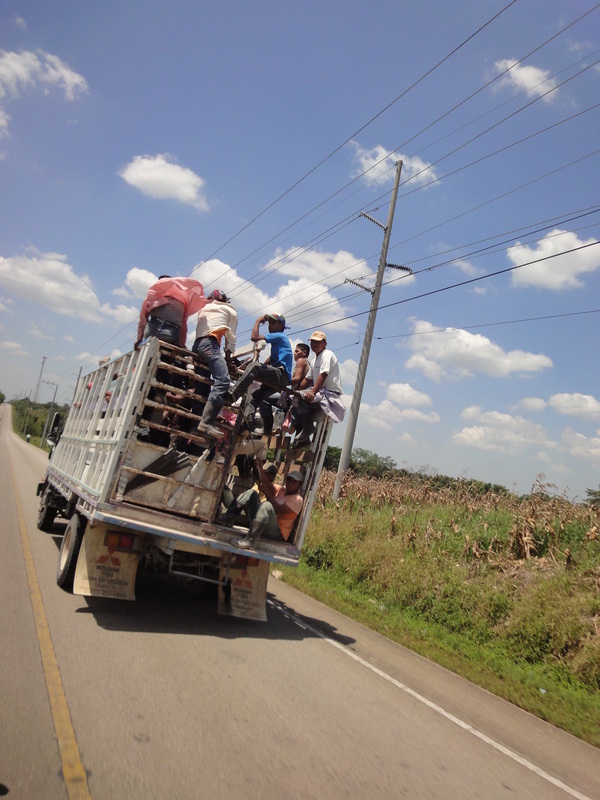 The roads through Guatemala are very windy, and the country is much more mountainous than I had expected. Driving through the jungle it was a lot more like what I had expected, but had not seen, in Belize. We had our first experience of a (very small) river crossing by ferry across the river in a town which seemed big enough to warrant a bridge being built. 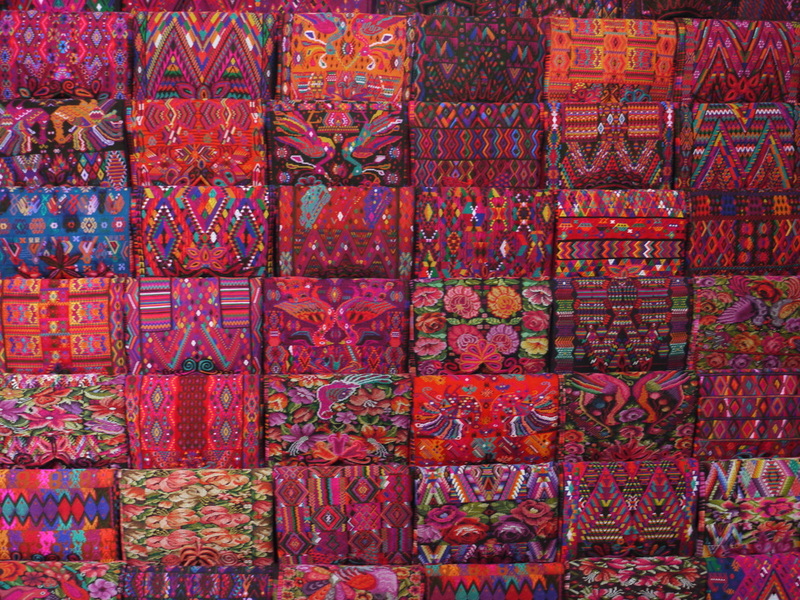 But this is Guatemala, nothing is ever as you expect it to be! Despite the scenery, neither of us enjoy travel days very much so we were glad to finally arrive at Zephyr Lodge at 5pm. The final 11km from Coban is along an extremely bumpy, extremely steep metal road which I am surprised vehicles can get up and down during the rainy season (although our guide the next day assures me they do!). There is no wifi or ATMs as the town is properly in the wop wops, but the lodge has a great relaxed feel about. Kim and Barry in Caye Caulker had recommended the place to us and its no wonder it fills up fast as it is set on the ridge of a valley allowing views of the sun setting to one side and the river on the other. 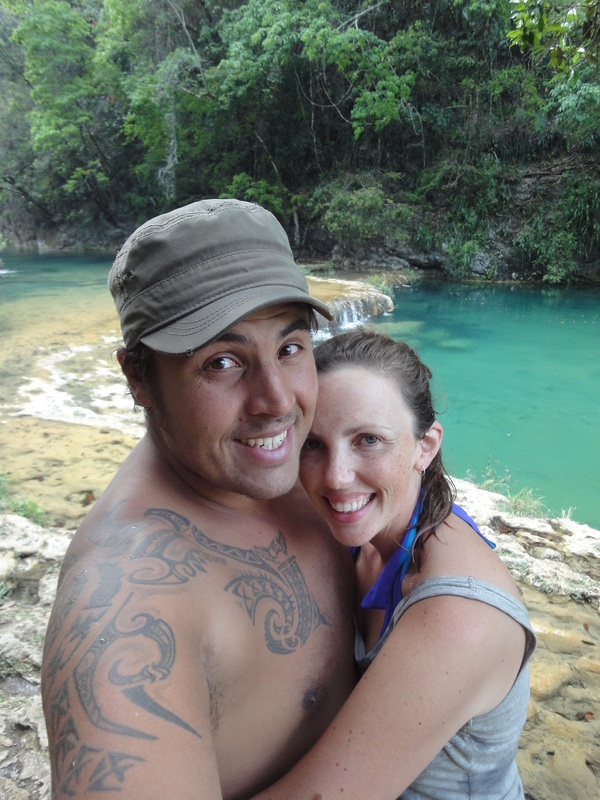 The following day we were up for a tour to Semuc Champey, the reason for our visit to the area. Hopping in the back of the pick up truck, we bumped our way along another 9km of metal road before arriving at the Grutas K’anba (K’anda Caves). 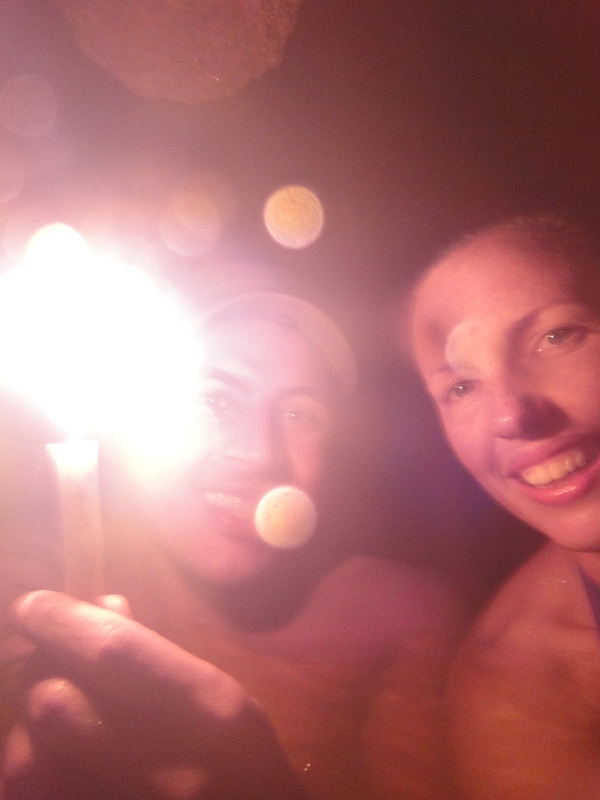 The caves are privately owned but Zephyr Lodge has permission for guides to take people inside and we spent a couple of fun hours exploring, sliding and swimming through them, with candles lighting our way. 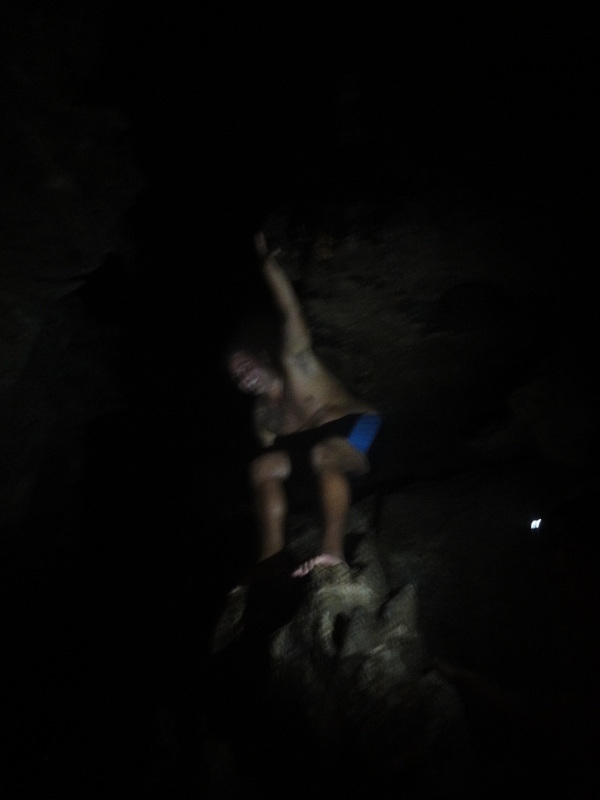 Ty even jumped off a rock into a very narrow pool but I was way too chicken! After the caves we were given the opportunity for a rope swing and then a bridge jump. Eager beaver Tyro was the first to go on both of them, but I was in scaredy pants mode so stayed on the safety of the bank as photographer. By the end of the day I had actually phsyced myself into doing the bridge jump and was quite looking forward to it but our van had arrived early to pick us up so I missed my chance. 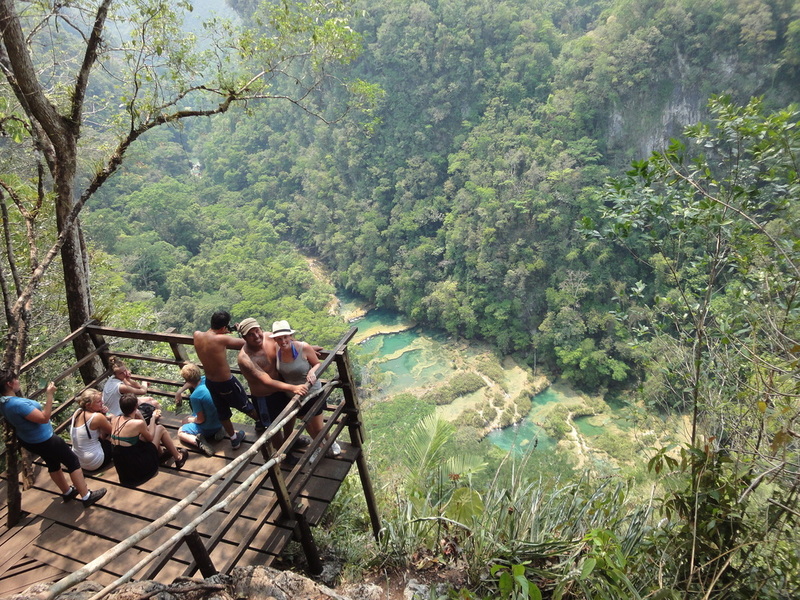 Semuc Champey is a 300m long limestone bridge, on top of which are a series of pools which are good for swimming. The water rises from the Rio Cahabon and most of it passes beneath the bridge, plunging out the other side. It is an impressive spectacle. Arriving at the entrance to the park we all hiked about 30 minutes straight up to get a birds eye view of the pools. Man it was steep! After lunch at the top we made our way cautiousy back down and into the pools for a much needed swim! You can visit the point where the river flows under the bridge, but after a few stupid tourists fell off and got flushed through, theres a permanent guard on duty who ensures you keep your distance from the edge. I was already to spend a few hours relaxing in the water when suddenly I felt something nip at my leg…. What the hell was that!? Fabulous…. Its those fish that like to nibble at your dead skin. I know people pay top dollar for fish pedicures but its not for me and it was pretty hard to relax after that as any time you stop moving they sidle on in! fortunately for me our guide decided to show us some fun natural sides along the pools so we went off adventuring. 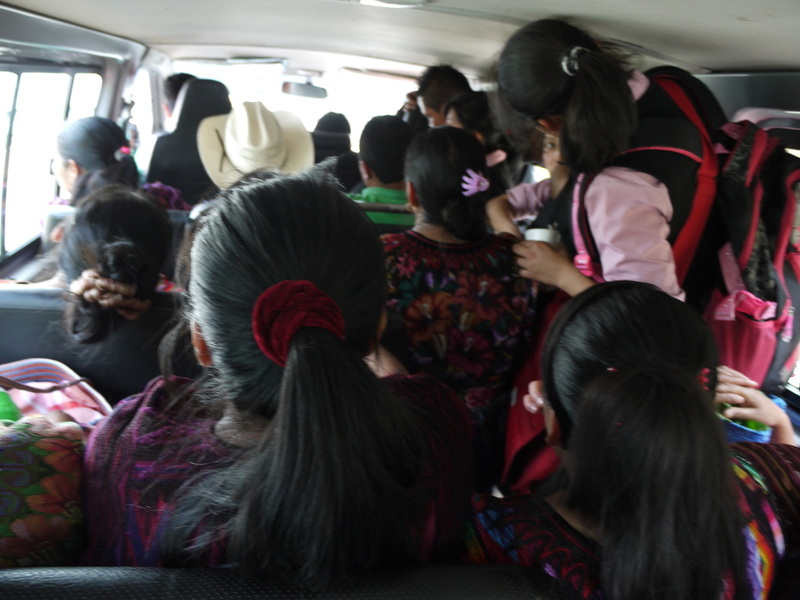 On the bumpy ride back to the hostel we all decided to channel the Guatemalan way of standing up in the back of the truck. They sure know what they are doing it was a lot more comfortable than sitting down! Even if our tired arms did get a bit of a workout holding on! Immersed in the dense Guatemalan jungle where the peaceful air is periodically shattered by the roars of howler monkeys are the phenomenal ruins of Tikal, described as one of the wonders of Central America. We’ve seen our fair share of ruins by now and have to say Tikal is definitely the most impressive so far! The original site is 16 square kilometres and had over 4000 buildings which housed the artisans, astrologers, farmers and warriors of the Mayan Civilisation. Underneath the current north acropolis there are more than 100 previous structures. 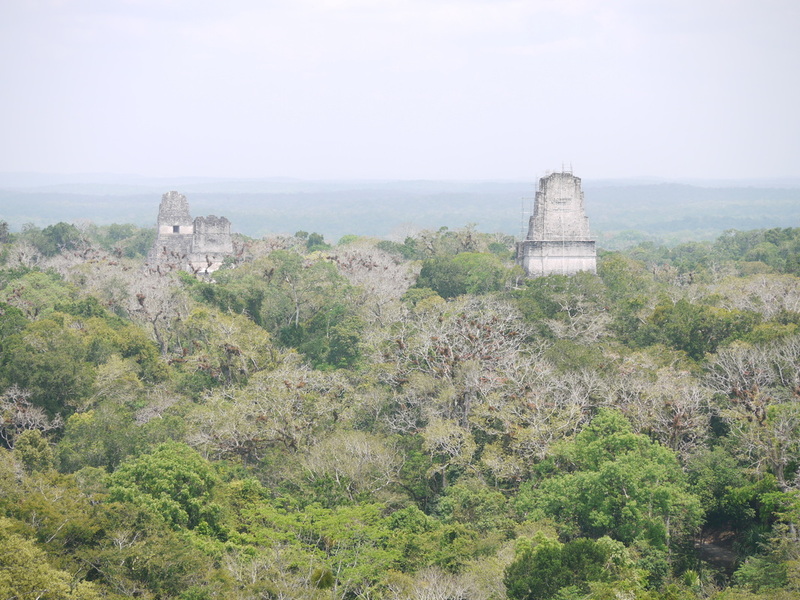 Many of the temples peek their heads through the forest canopy and a climb to the top of them allows for magnificent views across the jungle. Tikal is different to the other sites we have visited in that the jungle has not been totally cleared away to allow for tourism. In order to go from one pyramid to another you venture down walking tracks. While the main tracks are one car wide to allow for emergencies and disabilities the kilometres of trails mean that you can sometimes feel completely alone with nature. The site is known for its diversity of nature and everyone assured us we would see plenty of it during the day. We certainly weren’t disappointed! 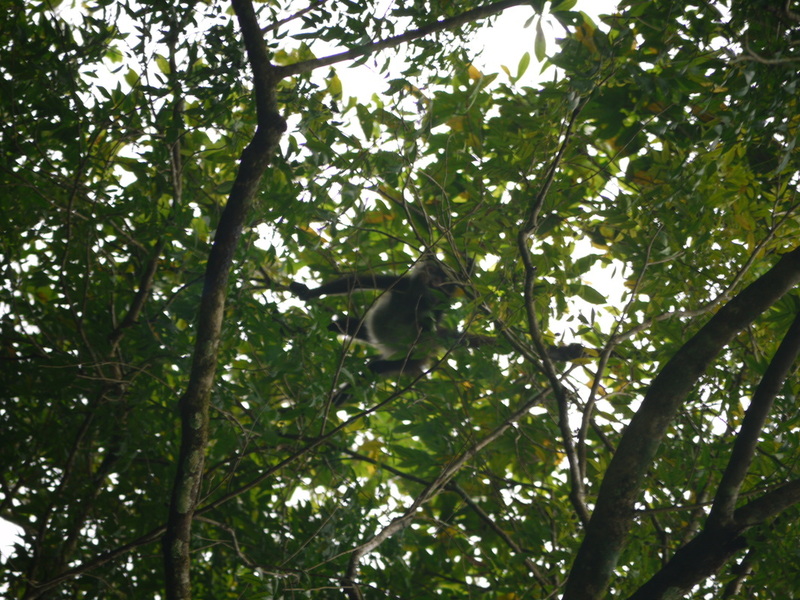 Within the first 20 minutes we spotted a group of spider monkeys swinging through the trees above our heads and a little orangey brown frog camouflaged so well into the leaves that we walked past him. Were it not for another group behind us stopping we would have missed him altogether. The protected reserve around the site saves thousands of trees from logging and rare birds and animals from the black market. 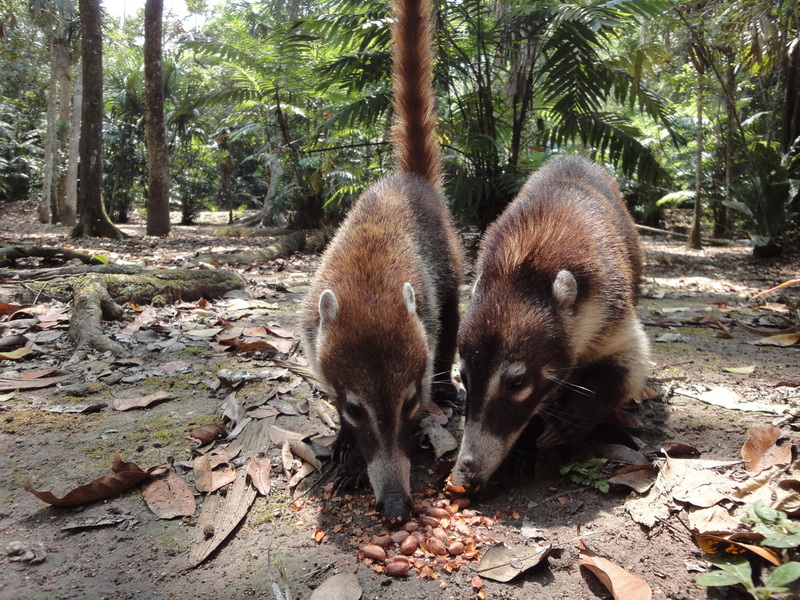 The forest is home to over 200 species of birds and even the jaguar, although we weren’t lucky enough to spot one of those!Ty shared his peanut snacks with the racoon–like Coatimundis, much to the amusement of the Mexican tour group nearby. At the start of the day we had just missed out on seeing a pair of toucans and Ty was really gutted walking back to the entrance that we haddn’t seen any others. We had seen a couple from a real distance when we were in Iguazu Falls 4 years ago but Ty was excited about seeing them closer up. 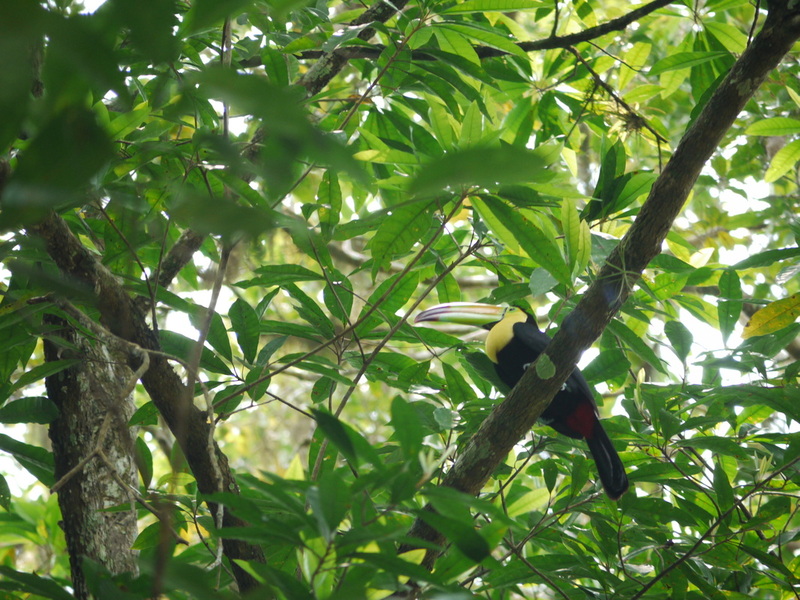 A couple of minutes later we were watching another cool looking red bird when a toucan flew over head. It was almost like he was showing off for us, darting between the branches and then turning his head to pose when we took a photo of him. Om nom nom, thanks Ty! Staying in the barrio we were given the opportunity to enjoy the traditional rice, beans and tortillas that Guatemalans enjoy every day. Three times a day. While they do mix it up with the occasional egg, or piece of goats cheese, we are used to a broader range of foods in our diet so It definitely took a bit of getting used and we were really excited to be able to stop and have fried chicken for dinner that night on our way home! First world problems! On our second day at Buenas Cosas, Angelica took us to visit a school in the next Barrio, and introduced herself and the organisation to the principal. 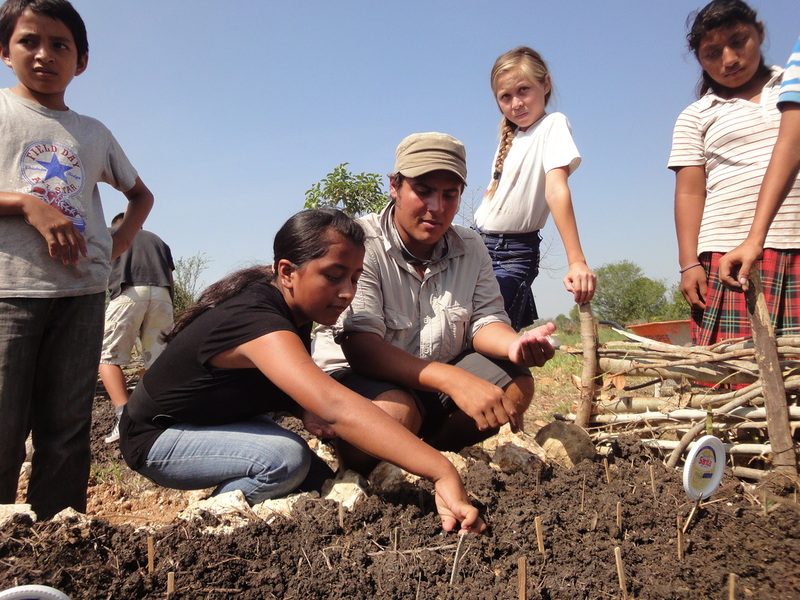 He agreed that he would be happy for us to come and help out teaching English and building a vege/fruit garden. Back at the casa (house) Angelica said we could use the internet to plan our classes – um what? We thought we were just helping their teachers out, but we WERE the English teachers! Oh, Crap! Eek those poor kids, neither of us have ever taught English before and our Spanish still isn’t that good either! Our commitment to volunteering was 4-5 hours per day and we were to teach 3 different classes; the big kids twice a week with half an hour each in the garden and on English; the middle kids twice a week for an hour solely on English; and the young ones for half an hour of English once a week. 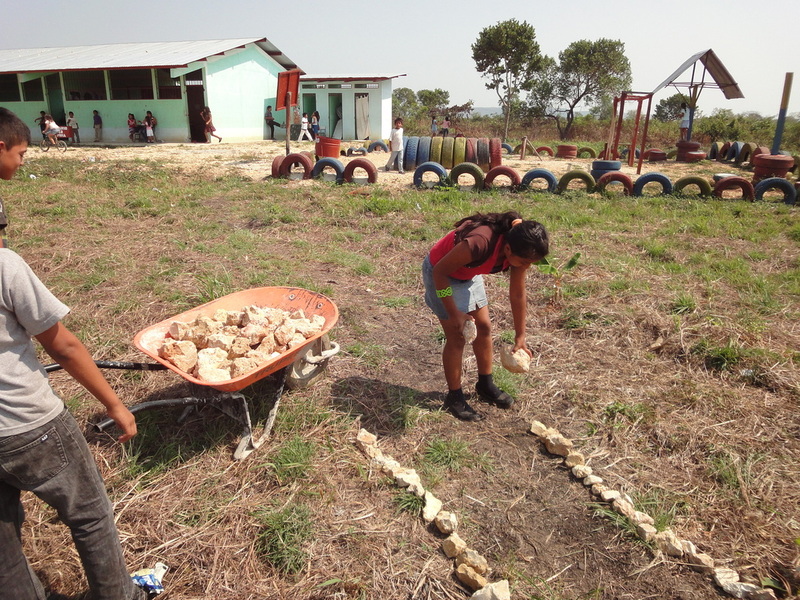 Outside of our classroom hours we would spend the rest of the time building the garden. 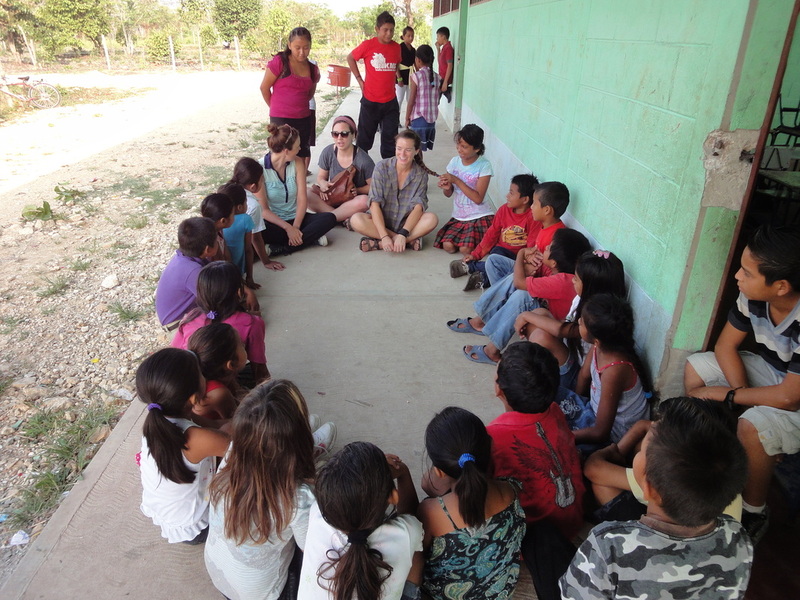 Another volunteer, Carly, joined us the next morning and the first day at the school was fantastic! The kids are all really neat and we were the first Gringos who had volunteered there so I think we were a bit of a novelty! Our first English lesson went better than we thought it would, and the kids were pretty excited to learn where NZ was, and to check out the flag we took along with us. Guatemalans don’t tend to have a big grasp on the concept of the other side of the world as life is very much focussed around family and community, so the kids were pretty shocked by the fact that it was the other side of the world. Es muy leho! Yes, it’s very far away! After English we took the big kids outside and they helped to choose an area for the garden and then, after a group photo, we broke the ground. Well, tried to. The soil was rock hard! This is not going to be quite as easy as we thought it would be! 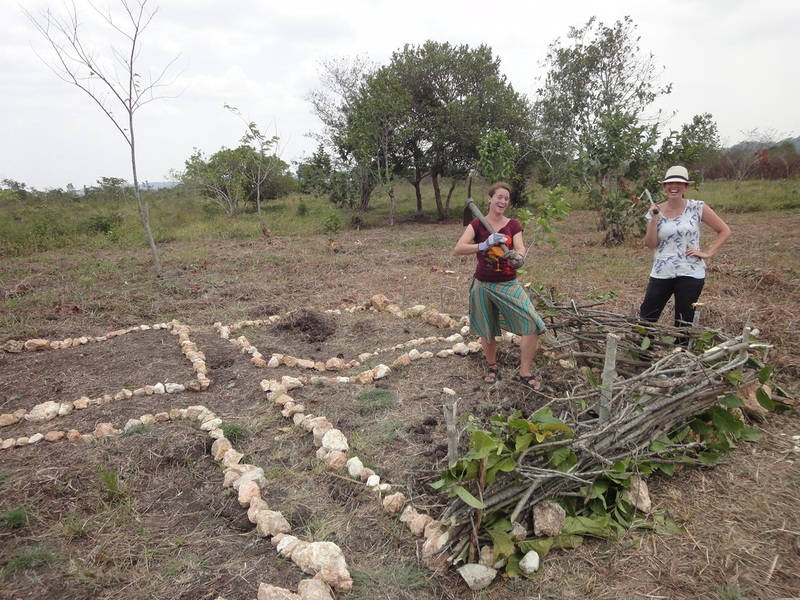 While the kids were back in class we began to define the area with rocks and create a wall using branches. Billy, one of the big kids, decided to help us out and ran around chopping branches down for us with his ridiculous machete skills. In NZ, we keep dangerous tools under lock and key from kids but in Guatemala they are all machete experts by the time they are 6 years old it seems. What was taking us Gringos 15 whacks would be chopped down in 3 by the kids! Talk about putting us to shame! The notion of ‘class’ seemed to be a bit of a fluid concept, with kids walking in and out when they feel like it, so we had more help during our garden time than we expected. The kids were so excited about having a garden though that it was really sweet. Even the kids in their early teens, who in NZ would have been way too cool to help out, were getting their hands dirty carrying rocks. A couple of hours in and we were feeling pretty proud of ourselves. We had some tangible evidence that a garden was being formed. But then we tried to digging. Oh my gosh the ground was so hard! 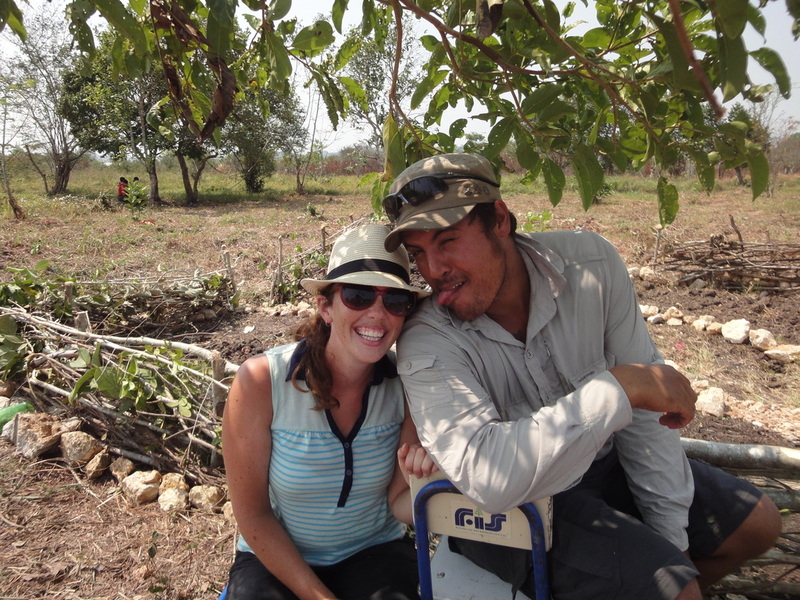 To make life a bit more difficult we only had one machete, one shovel and a pick axe between us. As we found out later apparently its almost impossible to buy a garden fork in Guatemala, which was what we really needed. It hadn’t rained in almost 2 weeks and with the regular 40 degree heat the ground was completely dry and rock solid. Looking a bit dejectedly at the huge garden we had laid out with the kids and thinking what a mammoth task it was going to be Ty had some great inspiration and we decided to break the garden up into quadrants, giving paths between the garden plots and at the same time reducing the surface area that would need turning! Good thinking babe! 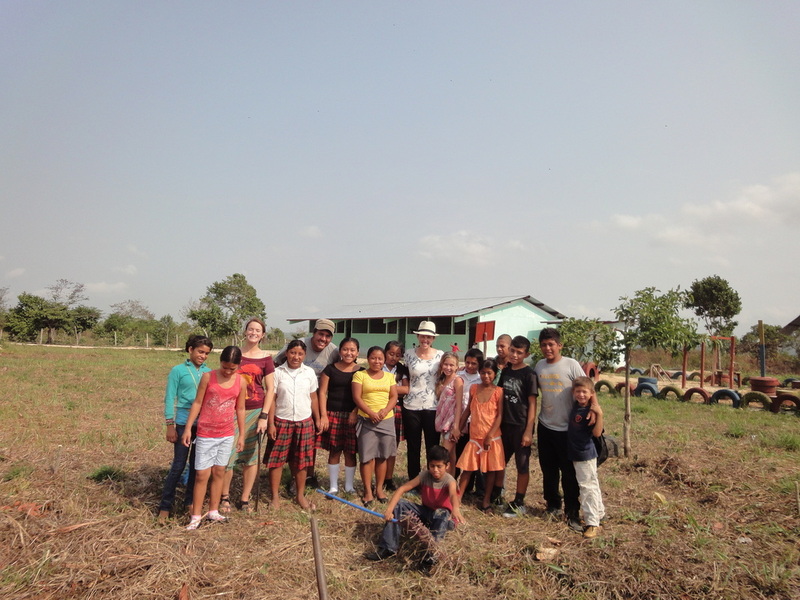 We had been joined by another volunteer called Liz and it didn’t take us long to get into the routine of school, gardening and then a stop at Roberto’s dairy on the way home for an ice cold apple juice, and Christy’s house for a frozen choconanna. Seriously, when I have kids one day they are going to be in the freezer! So delicious and way more refreshing than ice cream! Not to mention it’s technically a fruit portion haha. By Friday afternoon we all had callouses from using the pick axe to try and break the ground and were not looking forward to what we knew needed to be done next week but fortunately that night we had one of the biggest thunderstorms I’ve ever seen, which gave the ground a thorough soaking. Yay! Monday morning and the ground was ready for turning. Because the ground was incredibly uneven we needed to bring soil to fill the depressions before we started to make raised beds. Never until that moment have I appreciated the ability that we have in NZ to buy soil! Despite the rain on the weekend, it was still reasonably tough going and we needed to scout around the land by the school for the soil we would use. There were plenty of little surprises for us while we were digging, such as the fire ants which make your skin feel like they are burning and the scorpion we unearthed. And while I’m not a big fan of spiders, I do feel bad that my girly scream was responsible for the death of at least 1 tarantula. I came to learn to kick rocks before picking them up! 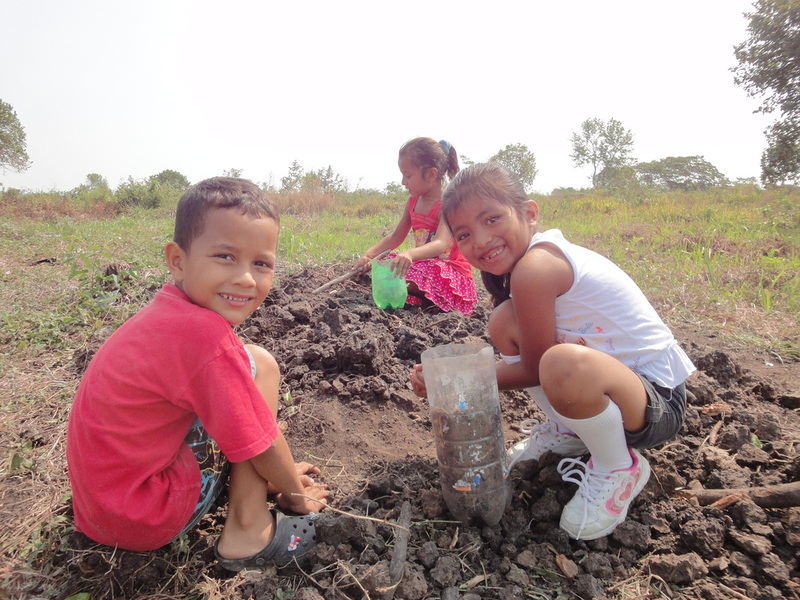 We were all pretty proud when we managed to plant our first mango tree in the middle of the garden and the following day Angelica gave us some tomatoe plants, and sweet pepper and radish seeds which the kids planted to complete our first raised cuadrant. Such a good feeling to have accomplished even that! 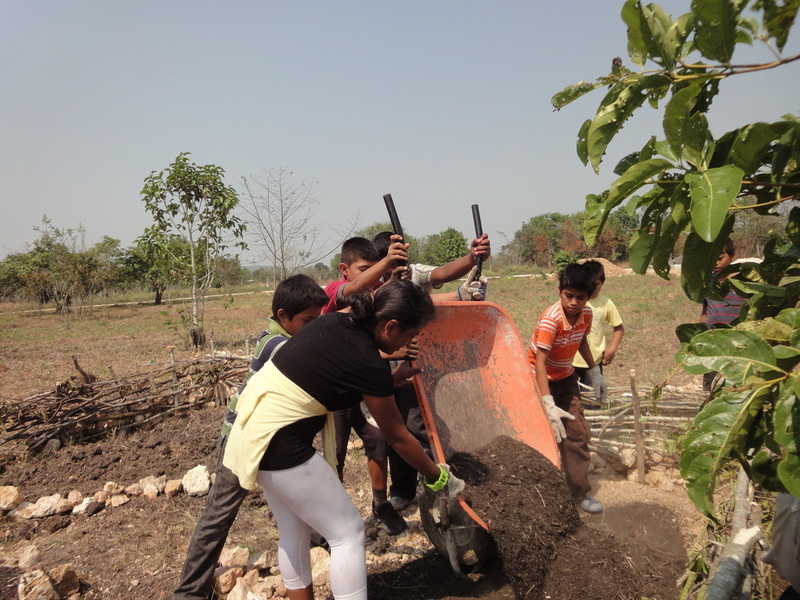 We were a bit concerned about whether the garden would last post our departure, but the kids proved that they were invested in it by showing up on the last day with horse manure, banana plants, mango plants and seeds for various other fruit trees. We made sure that each child got to plant their tree or seed and then claim it by placing a stake in the ground with their name on it. We also tried our hardest to make sure that they all knew that the plants needed watering every morning when they arrived at school. Not looking too bad even if we do say so ourselves! Despite the hard work our time at the school was incredibly rewarding, and we were sad to say goodbye to the kids, and the principle Eddy Josue. Our final day at the school and we had the BEST English classes of the 2 weeks. After the first couple of days I think our novelty had worn off a little but it was like when the kids realised we were going they wanted to soak up as much English as possible. Finishing class and Eddy called us into his room with the big kids. They had all written letters and drawn pictures for us, and Eddy gave a really lovely speech thanking us for our hard work. It was so sweet and nearly brought a tear to our eyes, making it that much harder to really leave! We were sad to leave Caye Caulker but it was time to move on. 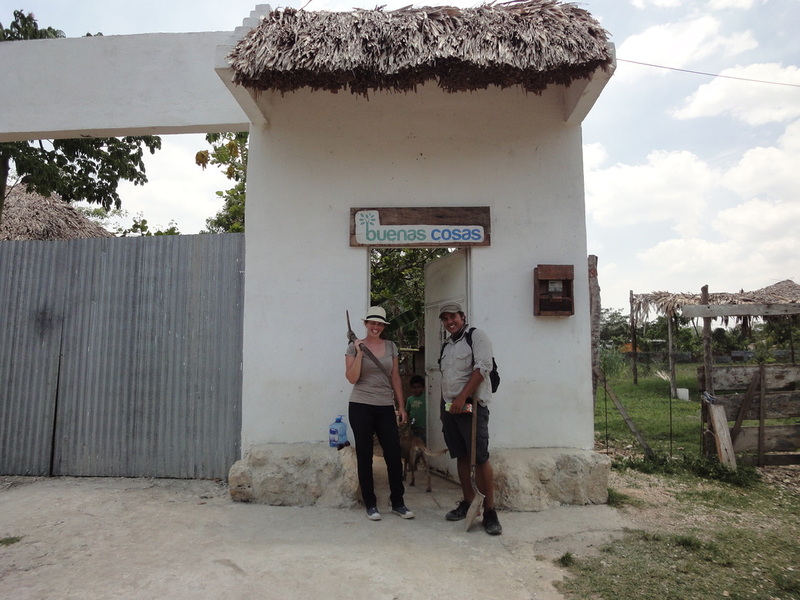 Because of the cost of a lot of the tourist activities in Belize, the island was our only stop here. Sailing back to Belize City, we thought we were going to miss the bus, as we had to stop to help another boat which had got itself stranded on the rocks, right next to the sign which says that it’s shallow and not to sail there. Good one guys! Using the Workaway website that we used around Europe, we found a volunteer place called Buenas Cosas (Good Things) in a town called Barrio Bellos Horizontes. 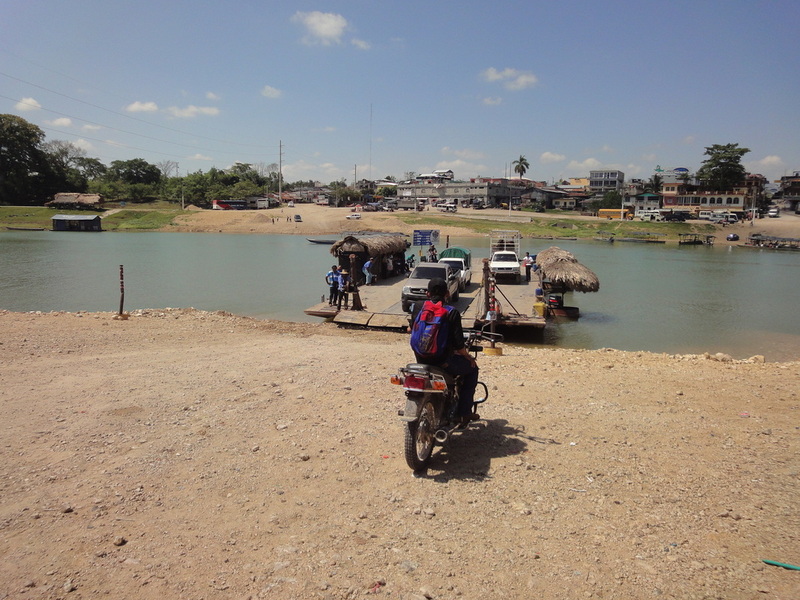 The organisation started 18 months ago, and has a very impressive website detailing projects that are occurring across different partner communities in the Peten district. Despite filling in their registration form, making the required donation and having email contact with them the week before, they lady who greeted us didn’t seem to know who we were and we had to fill out the forms again. 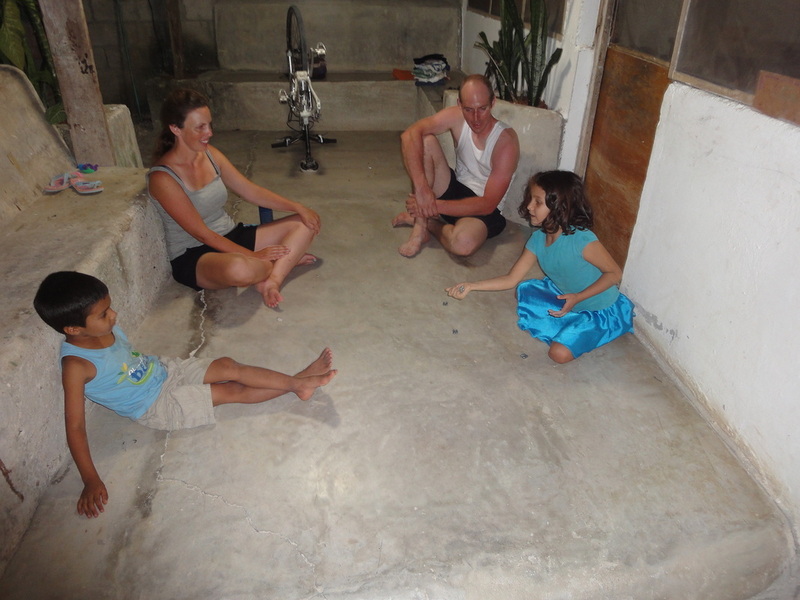 We sat around in the garden for a couple of hours kind of twiddling our thumbs until another Gringo (Memo) arrived. We (incorrectly) assumed that he was another volunteer and he made us feel rather awkward when he informed us he was in fact the husband of the director of the programme (Angelica), who was the lady we had been talking to apparently. After reading through some guidelines/rules for our stay and checking into our rustic accommodations, Memo took us for a walk around the Barrio. This gave us a chance to check it out and orient ourselves, and learn where the only shop was that sold icecream (very important information as it was 42 degrees on our first day!). The barrio is a lower socio economic part of Santa Elena and is home to 300 families, most of whom live with their extended families – often 10 people to a house. The majority of the housing in the Barrio is made up of simple wooden or concrete structures with dirt floors and corrugated iron roofing. Mains water is supplied for most houses but grey water systems are still being installed and as such most greywater is washed into the drains on the side of the dirt roads. 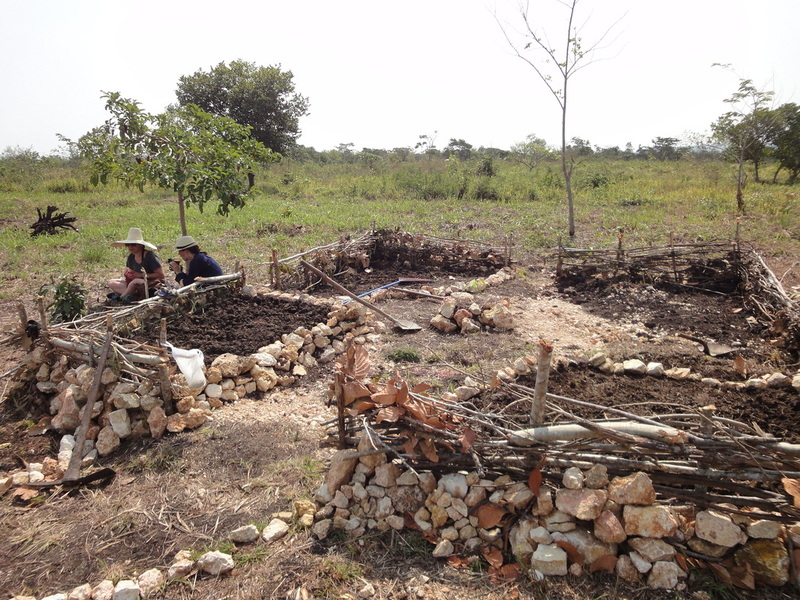 We spent the two weeks in the Barrio teaching english and building a fruit and vegetable garden at a local school. 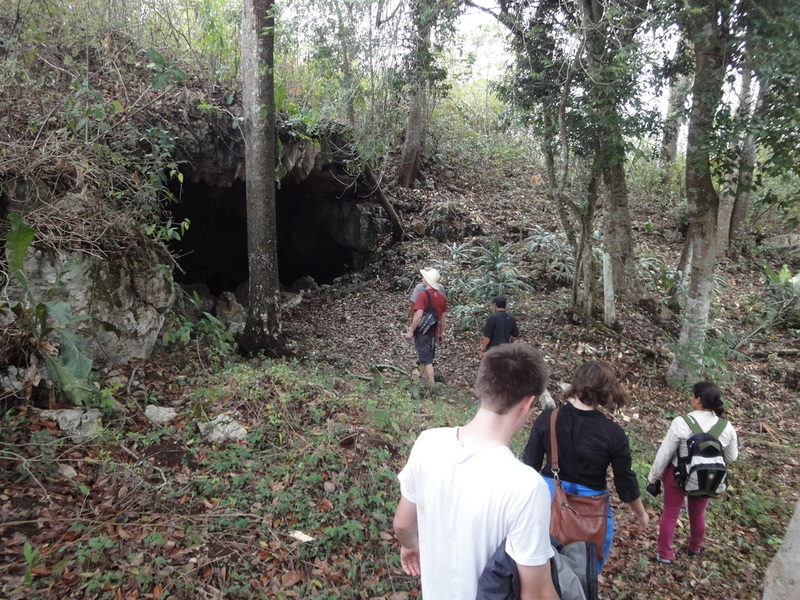 Being in the Peten District also gave us the chance to visit some local caves and the ancient Mayan site of Tikal. The work at the school was extremely rewarding however we found the organisation rather frustrating. With our university backgrounds in Human Geography we were really interested in what was happening, how things had been going, lessons learnt, most rewarding achievements etc but we were made to feel very awkward and out of place for asking questions which I believe were genuinely interested and legitimate questions. For a number of reasons, including political and financial, many of the projects listed on their website are more in the development, rather than implementation, stage. Some other volunteers were disappointed that they were unable to work on their chosen programmes (as workawayers we were put where-ever they deemed we were needed, but paying volunteers supposedly get to choose) and when they questioned things the responses they got were very blunt and accusatory. I believe that what the organisation is trying to achieve is excellent, but their current way of operating could do with a few adjustments. Despite trying to keep things neutral and positive the following discussions led to our final few days at the casa being rather awkward and we were sad to leave with a bit of a bitter taste in our mouths.